If our plant catches fire, when should it be allowed to burn down to prevent pollution? When does enforcement turn into prosecution, following an environmental accident? Will our environmental insurance cover the costs of remediation? 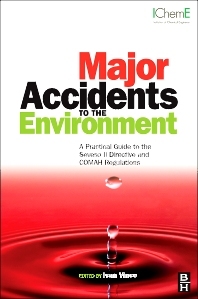 This book provides a thorough and practical guide to the environmental aspects of compliance with the Seveso II Directive and COMAH regulations and surrounding issues. It guides readers through the technical, legal and insurance related complexities unique to the environmental aspects of Seveso II/COMAH. Individual chapters and sections written by relevant experts explain the implications of the Directive/Regulations and other laws that relate to major accident hazards. Valuable case studies underpin and illuminate the arguments presented. The comprehensive appendices contain a wealth of further case studies as well as focused supporting information on environmental design, assessment and management of major hazard installations, for safety, prevention and environmental professionals, risk assessors, insurers, managers and their legal advisors. Dr Ivan Vince is Director of ASK Consultants and co-founder of one of the first industrial risk consultancies in Eastern Europe. He has investigated several environmental accidents. Professional health & safety practitioners, plant engineers, chemical engineers, environmental engineers, fire protection, ecologists, environmental and industrial lawyers. Graduate students of risk, H&S, and environmental management and engineering. Ivan Vince is a Chartered Chemist and Chartered Chemical Engineer with 40 years' experience in fields related to process safety, beginning with postdoctoral research at Imperial College involving flammability limits. He has taught postgraduate modules on risk assessment at several universities in the UK and abroad, given expert evidence at nine Public Inquiries and participated in the investigation of several major accidents, including Buncefield. Publications include Vince I (ed) (2008) Major accidents to the environment – a practical guide to the Seveso II Directive and the COMAH regulations (Oxford: Elsevier) ISBN: 978-0-7506-8389-0.; Vince I (2013) Explosion at a hazardous waste site caused by contaminated nitric acid, Chemical Engineering Transactions 31, 535.; Vince I (2011) Societal risk in land use planning – the scale of ‘scale aversion’, Hazards XXII, Symposium Series No.156, 408-410 (Rugby: IChemE). Director of ASK Consultants and co-founder of one of the first industrial risk consultancies in Eastern Europe. He has investigated several environmental accidents.